Dr. Brian DiGangi, a faculty member at UF and former Maddie’s Shelter Medicine Program resident, is one of the first veterinarians ever to become certified by the American Board of Veterinary Practitioners in the new specialty of Shelter Medicine Practice. A select group of only 10 veterinarians sat for the first certification exam in November at ABVP’s annual symposium. 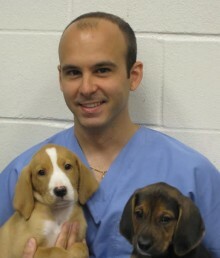 Dr. DiGangi completed a three-year residency in shelter animal medicine at UF in 2010. He was the first shelter medicine resident our program at the University of Florida has ever had. Among his honors are receiving the Best Resident Platform Presentation award during Phi Zeta Research Emphasis Day in 2010. The following year, he completed a Master of Science degree in Veterinary Medical Sciences. Dr. DiGangi currently serves as a clinical assistant professor of Shelter Medicine with UF’s Veterinary Community Outreach Program. He trains veterinary students in shelter medicine best practices and in pediatric spay/neuter procedures by treating shelter animals in the Gainesville area. He also serves on the executive board of the Association of Shelter Veterinarians. All of us at Maddie’s Shelter Medicine Program congratulate Dr. DiGangi on this historic accomplishment.